The Hanon finger exercises have been a staple of piano teaching for more than a century - and with good reason. They are easy to understand and therefore to play and they train the fingers to obey mental commands as well as warming the hands up nicely for repertoire practice and performance. Anybody hoping to become or remain a keyboard player or performer needs technical practice to maintain any level of skill. Supplemented with more advanced technical exercises as necessary, the Hanon finger exercises offer a simple first-choice solution to doing just that. Here's an introductory video explaining how the Hanon finger exercise patterns work. Download the hard copies (Nos. 1 to 10) here. 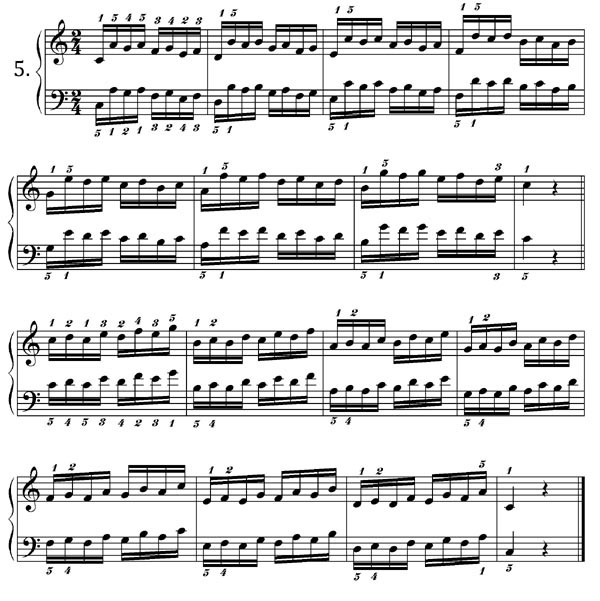 There is no shortage of free Hanon downloads - www.free-scores.com has a Hanon Nos. 1-20 facsimile set and a shorthand version of the same. The problem with these versions is two-fold. 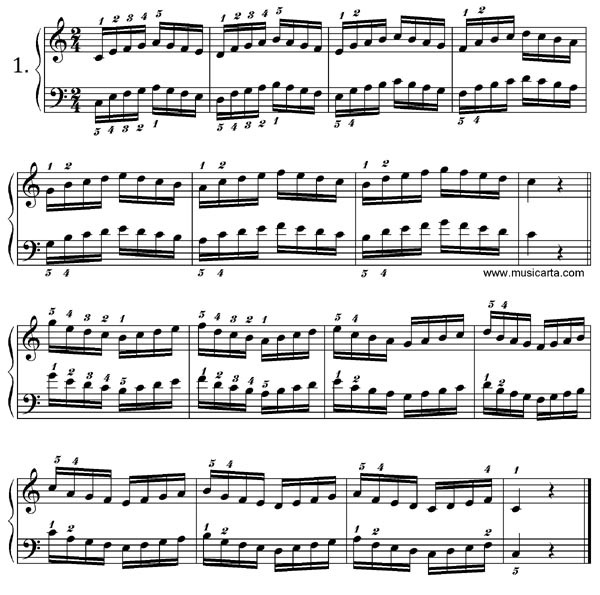 Firstly, they span two octaves, more than is needed to practice, in the author's opinion (on the grounds that you would gain more from practicing one octave each of two patterns than two octaves of the same pattern). Secondly, and partly as a result, they present an off-putting dense, black, and frankly doom-laden appearance, stifling critical practice and inhibiting innovation. 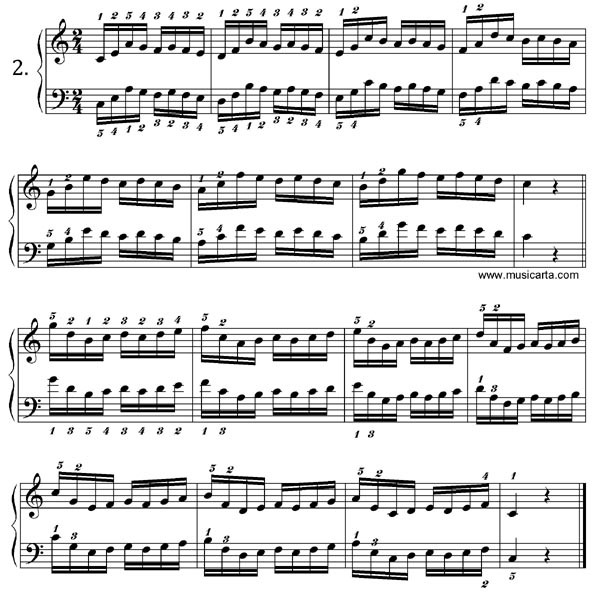 Musicarta response has been to offer a video introduction to the first ten Hanon exercises which has proven immensely popular but in its original www.musicarta.com incarnation and on Udemy and Skillshare. The online pages you are browsing now also have reference audio-visual performances which demonstrate the pattern rehearsed. Listening before playing helps model the performance in advance and pulls the attention away from the written music and towards the performance. 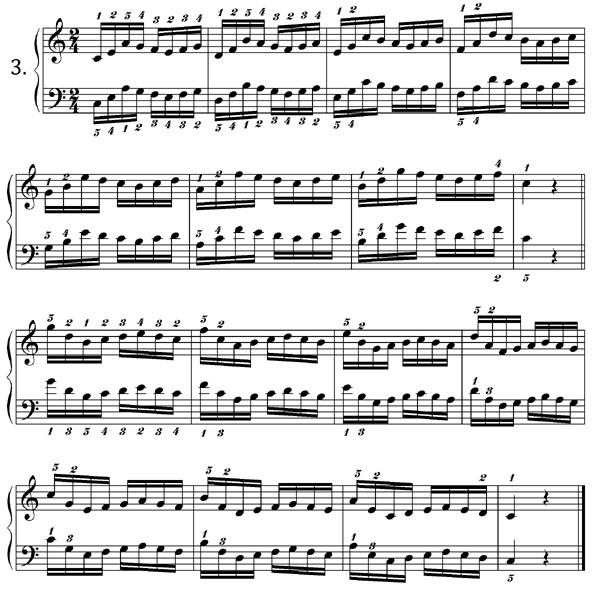 Unlike the original format, the Musicarta versions of the exercises cover one octave only. The first ten exercises are split up over two web pages with page anchors so that pupils can be directed straight to their exercise-of-the-week. As to the hard copy, which you can download here, Nos. 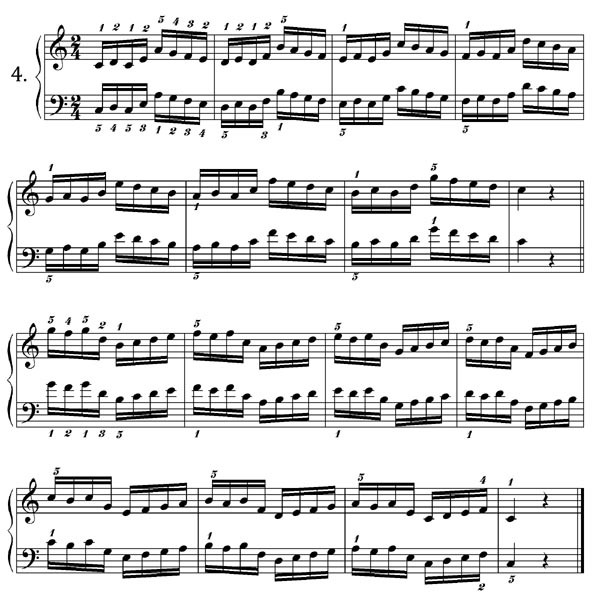 1 to 10 are presented over one octave only, and only one exercise/pattern per page - for ease of printing off for weekly distribution and to maintain a light look on the page. A line diagram of the shape of the exercise is given, with an exaggerated thumbnail sketch of the profile to guide you. The more quickly you can see and play 'the pattern', the more quickly you can concentrate on letting the exercises truly improve your technique. Once pupils understand how the exercises creep up and down the keyboard and can 'spot the pattern' reliably, a Hanon shorthand (Nos. 1-30) version should be all that is needed. And yes, these are exercises! Try to build up speed, accuracy and volume. Piano playing is a lot more physical than most people at first think, and practicing can usefully approached as if you were training for a sport!